Lead disposal bags for removal of contaminated lead construction debris. One sticker per bag included to label hazardous waste. Bags are thick, 6.0 mil EPA approved, Size 36" x 48" , Box of 5 ea. 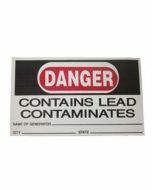 Safely contain and label lead hazard trash. Eliminate tears, punctures and broken bags. Recommended for use with heavy metal parts, protruding products and sharp objects or construction debris. Virgin polyethylene film. Larger quantity quotes available. Meets EPA, FDA and USDA specifications. Includes 1 lead hazard sticker per bag.